Frederick Donald Fox was born in Beeston on 15th October 18962, the eldest of two sons of Frederick Isaac (b. 1863, Nottingham) and Kate Fox (b. 1862, Nottingham, née Earp). Frederick senior was an Incorporated Accountant who held a senior position in the City of Nottingham Treasury. In 1895, he had married Kate Earp, the daughter of the late Robert B Earp (1830-1894) who had operated a stationers' business at 3 Market Street Nottingham3, and set up home at Cavendish Place, Beeston. In 1901, they were recorded there with their two sons, Frederick Donald, age 4 and Frank Herbert, age 34. By then, Frederick senior was an assistant accountant to the City Council. In 1911, the family was still at Cavendish Place, Beeston, Frederick had continued his climb through the ranks of the City Treasurer's office and the two sons were in private education in Nottingham5. 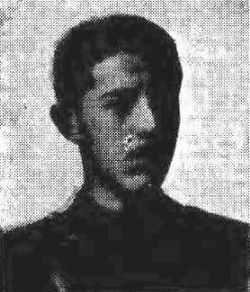 Just prior to the outbreak of war in 1914, Frederick junior became articled to an Incorporated Accountant in Nottingham and, in October 1914, he joined the Nottingham University Officers Training Corp. He and his brother also served as teachers at the Parish Church Sunday School on Station Road, Beeston. Although a spell of ill-health delayed his training, it was resumed with the 4th Officer Cadet Battalion and he was gazetted as a 2nd Lieutenant with the Sherwood Foresters in August 1916. He joined the 17th (Service) Battalion (Welbeck Rangers) on the Somme, in France in September 19156. The Battalion had landed at Le Havre, France on 7 March 1916 as part of 117th Infantry Brigade 39th Division and, by the time of Frederick's arrival had already been in the thick of the fighting in the Somme that summer with very heavy casualties, which were to continue into the autumn. On 3 September, the battalion, then comprising 19 officers, 1 medical officer and 650 other ranks, had taken part in a major attack on the village of Beaumont-Hamel. Although one company had been able to occupy the first line of the enemy trenches, the second line was strongly held by the enemy with machine guns and casualties had been heavy. Despite reinforcements, attempts to penetrate the enemy's second line defences were blocked by artillery and machine gun fire and they were forced to withdraw. Casualties had been high with 59 killed, 221 missing and 156 wounded - one company with 75% casualties with parts of the trenches described as "full of dead". Over the course of the next two weeks, reinforcements arrived which totaled 24 officers and 270 other ranks. 2nd Lieutenant Fox was amongst that anonymous number who arrived in the midst of this terrible time for the battalion. It would have been a very steep learning curve for him, the other young officers and their inexperienced men.5. Much of the early part of October was spent in the trenches with regular attacks on both sides. On the 8th the battalion faced an attack by the enemy using flamethrowers but was able to counter-attack inflicting casualties and taking prisoners. Another attack on the following day, against the Schwaben Redoubt was particularly successful, with several from the battalion recommended for the Military Cross. Nevertheless, over five days of action, 29 other ranks from the battalion had been killed and 1 officer along with 74 other ranks wounded. By the 17th October, the battalion had moved into trenches in the Thiepval (River) Section where they faced days of enemy shelling and heavy rain as well as the need to drive off enemy attacks. Over five days, 18 men of the battalion were killed, 7 officers and 53 other ranks were wounded and 7 were missing. These conditions, and levels of action and resulting casualties continued over the rest of the month. For Lieutenant Fox it must have been a terrifying introduction to trench warfare although he could take great consolation that the battalion of which he was part, despite great difficulties and losses, had played a major part in capturing the Pozieres Ridge and the high ground that dominated the Ancre Valley7. There was more information given to his parents in a letter from his Captain. He wrote : "Lieut. Fox was killed on 5 Nov, while leading his platoon out of the trenches. He was struck by a shell and died at once. I was with him just before his death, and we shared the same corner of the dug-out, and he was a most charming companion. He was one of the best officers I had, quite fearless and always ready to undertake any kind of work, and he will be greatly missed both by the officers and men". 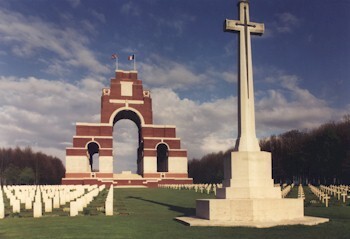 2nd Lieutenant Fox's body was never identified and he is commemorated on the Thiepval Memorial to the Missing which now stands adjacent to the Leipzig Redoubt. The memorial was unveiled on the 1st August 1932 by the then Prince of Wales and is the largest British War Memorial in the world. Standing 150 feet high, it dominates the surrounding area. The memorial stands on a concrete raft 10ft thick, built 19ft below the ground, the solution to the problems of building over the warren of tunnels that formed the German second line. Designed by Sir Edwin Lutyens the memorial has sixteen masonry piers, where can be found, on the panel faces, the names of some 72,000 British and 830 South African soldiers who died and have no known grave, during the period starting in July 1915, when the British Third Army took over from the French, through the Somme battles of 1916, until 20th March 1918, the eve of the last great German offensive on the Somme. The focal point of the memorial is the Stone of Remembrance, which lies under the great arch and centrally between the piers, for which Rudyard Kipling chose a quotation from Ecclesiasticus, "There name liveth forevermore". He was posthumously awarded the British War Medal and the Victory Medal8. In due course, his financial effects, including the balance in his account with Cox & Co, a banker used by Army officers at that time, amounting in total to £43 11s 6d, were paid to his father. He also received his War Gratuity of £5 on 1 October 19199. The loss of their eldest son would have been a terrible blow to his parents but this was to be made unimaginatively worse, in August 1918, when their other son, Frank Herbert Fox, was killed in action while serving as a 2nd Lieutenant with the Bedfordshire Regiment. They were to arrange for a pair of brass memorial plaques to their memory to be placed in the nave of Beeston Parish Church. The associated dedication plaque tells of their deep feeling for their sons : "They were the delight of our eyes and a glorious fragrance clings around our memories of them. The Lord giveth and the Lord hath taken away. Blessed be the name of the Lord." Frederick Donald Fox's name is also included on Nottingham University College, Officer Training Corps memorial to those who fell in the Great War. situated in the Trent Building. Nottingham University10. He is also recorded on a memorial in Beeston Parish Church to its Sunday School teachers who died in the Great War11. Frederick Isaac Fox went on to become Treasurer to the City Council in 1919. By 1920, he and his wife had moved from Beeston to live in Nottingham, eventually - by 1925 - at 21 Park Valley in The Park, Nottingham12. They retired to live in Beltinge, Kent, near Herne Bay, Kent. Frederick died in 1935 and is buried in Hillborough Churchyard, Herne Bay, overlooking the sea. Kate followed in less than a year13. 3Their wedding on 7th September 1895 was at Beeston, though not at the Parish Church (Nottingham Guardian, 7 Sept 1895). 5Beeston, 1911 Census, Piece 20427 RD429 SD3 ED2 Schedule 281. 6Details of Frederick's officer training, are from his entry in the De Ruvigny's Roll of Honour. 7This account of the battalion's involvement in the Somme battles is derived from its war diary The entry for November 5 1916 is extracted from that diary. The statement "Situation normal" occurs throughout the diary at this point. It seems to indicate that 'nothing' other than the routine of life in the trenches and billets was happening. It was certainly not 'normal' life. 8Details from Joseph's Medal Card and the Medal Roll - available on ancestry.com. A reference on the card to previous service as a Private with the Oxford & Buckinghamshire Light Infantry is not understood and is probably a confusion with another soldier. 9Details from "Army Register of Soldiers' Effects, 1901-1929" - available on ancestry.com. 12Frederick is listed as "City Treasurer & Supt. Asst. Overseer" at an office on St Peters Church Side, Nottingham at a succession of home addresses in Kellys Directory for 1920, 1922 and 1925. 13Frederick died on 21 August 1935 while living at Rose Garth, The Lees, Beltinge, Kent and was buried in Hillborough Churchyard, Herne Bay three days later. There is an account of the simple ceremony in the Nottingham Evening Post of 24 August 1935. Kate died on 5 January 1936 while living at 44 Brunswick Road, Hove, Sussex.